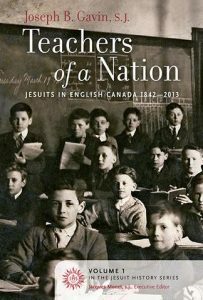 Joseph Gavin’s Teachers of a Nation: Jesuits in English Canada, 1842-2013 and Builders of a Nation: Jesuits in English Canada, 1842-2013 are available as the first installments of the Jesuit History Series published by Novalis. The series will look at the Jesuits of English Canada. In Teachers, Novalis notes, Gavin “focuses on the Jesuits’ role in education in Canada” and their “vital contributions to academic excellence, founding institutions and nurturing young minds across generations.” Builders, meanwhile, examines “the Jesuits’ work with native spirituality, their involvement in media and communications, and their commitment to social justice.” A third volume (Conscience of a Nation) will be available in 2017. Update: The Journal of Jesuit Studies has reviewed Teachers of a Nation (Volume 3, Issue 2). Update: The Journal of Jesuit Studies has reviewed Builders of a Nation (Volume 3, Issue 4).